MARESIAS, SÃO PAULO, BRAZIL (Saturday, November 3, 2018) – The final day of competition of the WSL Men’s QS 3,000 Red Nose São Sebastião Pro culminated in exciting fashion in front of a packed beach at Praia de Maresias that witnessed Yago Dora (BRA) defeat Jesse Mendes (BRA) by a score of 13.03 to 10.83 respectively. Dora’s uncanny ability in the air earned him several scores in the excellent range which led him straight to the winner’s podium. Yago was in complete sync with the waves throughout the day which gave him perfect opportunities to go big when he really needed it. “Maresias has always been a place I’ve loved coming to, but have never gotten a good result. Despite that, I’ve always had a good connection with the waves here and it’s a place I love. To win my first contest in Brazil here makes it even more special,” concluded Dora. The Final began at a sluggish pace with both surfers taking to the air, yet no one was able to complete a landing until way past the midway mark. That’s when Dora boosted a huge air for an 8.50 and a solid lead over Mendes. Needing a 7.04 to take the lead, Mendes did his best on the last wave of the heat but only scored a 4.83. The local siblings from Maresias, Miguel and Samuel Pupo (BRA) were hometown favorites and were heavily cheered by the crowds throughout the week. Miguel won the event in Maresias in 2015, propelling him to a spot back on the CT while Sammy recently clinched the 2018 WSL South America Pro Junior title in Peru a few weeks back. With momentum on their side, the came into the Red Nose São Sebastião Pro looking to make the local crowd proud. Seeded on opposite sides of the heat draw, expectations began to rise as the brothers continued to advance throughout the week. When the decision was made to finish competition on Saturday, everyone at the event couldn’t help but think about a Pupo vs Pupo Final. When both reached the Semifinals, anticipation reached a climax. However, fate was not on their side as both were eliminated by the Finalists. Another important moment in the day came when Wesley Santos (BRA) became the 2018 WSL South America Regional Champion. 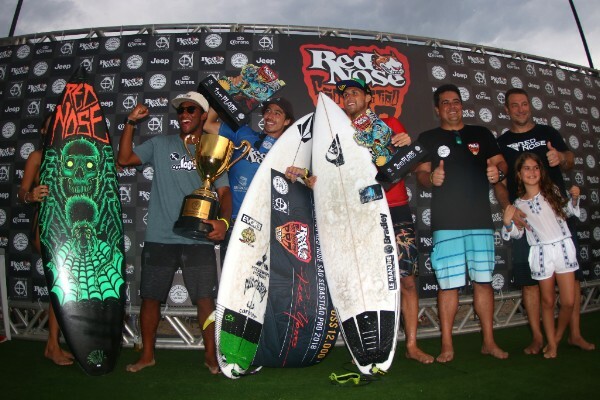 The rankings leader Alonso Correa (PER) opted to compete in Hawaii rather than Maresias and paid a hefty price as Santos earned a Round 5 result to clinch the title. Santos now has automatic entry into all QS 10,000 and QS 6,000 rated events in 2019. ​ ALL RIGHTS NOT SPECIFICALLY PROVIDED ABOVE ARE RESERVED BY WORLD SURF LEAGUE. This entry was posted in Adventure, Featured, Global News, Surf, Water by admin. Bookmark the permalink.